The last line of the letter relates to Albert Hofmann’s famous book “My Problem Child“, which discusses his accidental discovery of LSD and how its misuse drove it to become illegal and eventually fuel the 1960’s counterculture movement. There’s no word on if Steve Jobs responded to the request. 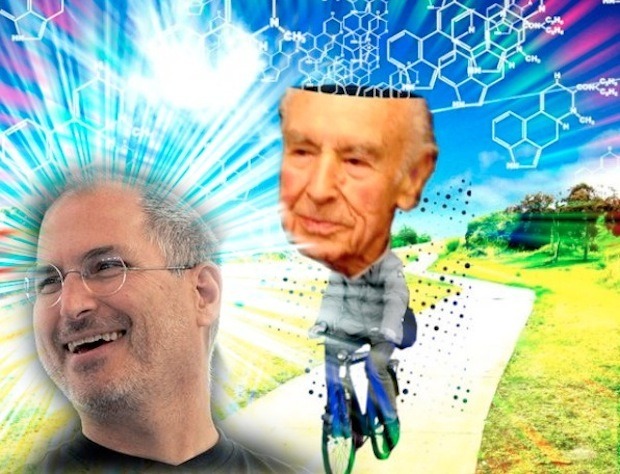 Albert Hofman passed away a year after sending the letter in 2008, and Steve Jobs passed away on October 5, 2011. The early chapters of Steve Jobs bio covers this topic extensively. I have no interest in drugs or substance abuse, but it’s quite fascinating to see how it shaped the man and his creative process. An unusual character, indeed. Actually, the capitalization in the title is grammatically correct. You misspelled ‘Hofmann’ in the first paragraph (you’re missing the second n). Here’s a painting of Steve Jobs on L.S.D.